Discover more about your data. Ideas looks for patterns in your data that it can use to create intelligent, personalized, suggestions. 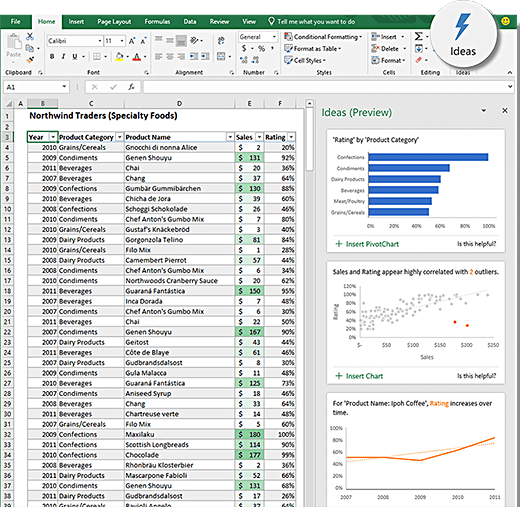 Ideas for Excel makes it easier to analyze data and create interesting visualization as well as helping discover different perspectives on users’ data. Open Ideas on any tabular dataset and see what recommendations are shown. With dynamic arrays you can write a single formula that returns a list of values. One formula, many values. And because Excel’s grid now understands arrays, we’ve added amazing new functions that work with lists. So, for instance, you can use the SORT function to sort a list, the UNIQUE function to remove duplicates from a list, the FILTER function to extract an interesting subset from a list. And when your data changes, the dynamic array will resize and recalculate on the fly. what are the right functions newly implemented ? I am on Windows Insider (Fast), and have Excel for Office 365 MSO 16.0.10927.20000) on my laptop. Ideas feature is present and working fine (impressive actually). But the 'dynamic arrays' (SORT(), UNIQUE() etc is not present. I cannot write a formula =SORT(A1:A10) or similar as suggested. SORT (and UNIQUE etc) are simply not recognised. Do I need to do something special for this ? Today (9.Oct) I got a further O365 update. I'm now on 16.0.11005.20000 and still no sign of the dynamic array functions to show up. Dynamic Arrays are still rolling out, but are not yet available to 100% of users in Insiders Fast. More users will see it as they continue to roll it out. Thabks for the reply Jesse. Guess some patience is called for. Hard when this is the most interesting Excel feature I can rem in last 20 years ! Any clues on timeline ?